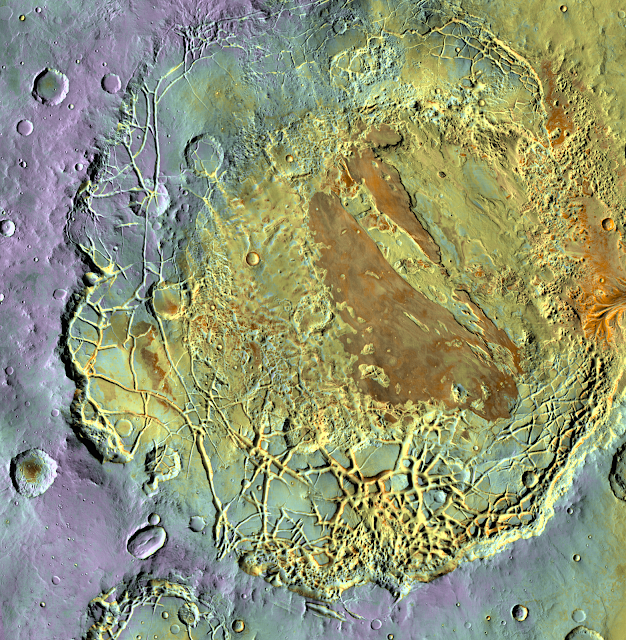 Today's Image of Mars shows Aram Chaos in false color, as taken by Mars Odyssey Orbiter's THEMIS camera. Aram Chaos is a 280km wide basin in Western Arabia Terra formed over four billion years ago when a huge asteroid hit the surface. Over millions of years material filled the crater. Because the Martian environment was much wetter the material became saturated with water. As the climate changed the water froze, but then something strange happened. The ice melted. Scientists aren't sure what caused the ice to melt, but they believe that molten rock moved into the ground below the basin. When the water-ice melted all the sediments that were frozen with it collapsed and formed the chaotic network of valleys, mesas, and hills you see below. The melted water-ice began pooling in the basin and eventually overflowed the eastern basin rim. When the water rose above the eastern rim it created a channel measuring 15km wide, 80km long, and 2500m deep, flowing into Ares Valles. After the formation of all this chaotic terrain, Aram refilled with water. The water deposited sediments over the chaos terrain. These sediments varied in composition, leading scientists to believe the environment was in a state of transition. Hematite is abundant in Aram Chaos; in fact, it contains the second largest known deposit on Mars, after Meridiani Planum. Hematite usually forms in association with water, so it's no surprise that scientists were interested in investigating the area in hopes of finding evidence of water on Mars. In fact, scientists were so interested in examining hematite that they sent Mars Exploration Rover Opportunity to Meridiani Planum, where it found the now infamous blueberries, which are hematite-rich nuggets that formed within water-saturated sediments. It's safe to assume that similar features would exist in Aram. The OMEGA instrument on board Mars Express has more recently detected large deposits of sulfates in Aram. Like Hematite, sulfates are usually formed in the presence of water, which lends credence to the previous conclusions that water was once abundant in Aram Chaos. Aram Chaos has a long fascinating history and it promises to continue producing surprises as scientists begin to learn more about the conditions under which it was formed. This image comes from THEMIS aboard the Mars Odyssey Orbiter. Clicking on the image will take you to the original high resolution image from THEMIS. To see their article on Aram Chaos click here.